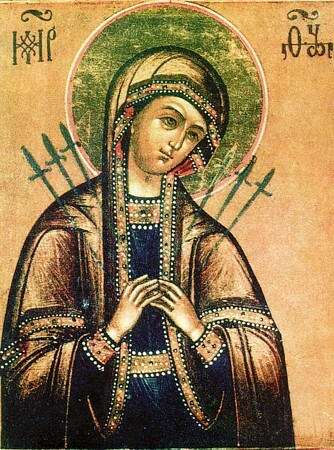 Upon the "Seven-Arrow" ("Semistrel'na") Icon of the Mother of God is depicted a piercing by seven arrows. For a long time the icon was situated at the bell-tower stairway entrance of a church in honour of the Apostle John the Theologian (near Vologda). Turned face downwards, they mistook the icon for an ordinary board along which they walked, until a cripple in the city of Kadnikova had a vision; that he would receive healing after a prayer before this icon. They served a molieben before the discovered icon, after which the sick one became well. The icon was especially glorified in 1830 during the time of a cholera epidemic at Vologda.